Last weekend, we warmly welcomed Michael into our Islington Flagship Store, where he showcased the latest additions to his expanding range of colours. The current range has 78 colours, with plans to increase this to 100 (Michael says this is because he’s designed a paint rack with 100 holders and therefore has to fill it!). Although generally each artist will only use about 8-10 colours, he receives constant requests for new colours. The logic behind choosing colours is pretty simple: “If I don’t like the colour, I won’t like making it, so I don’t”. This isn’t an issue whatsoever, as he clearly has an eye for beautiful paint, “Colours like Quinacridone Crimson look so gorgeous, I just want to dive in”. Red Lead looks like the colour of a Ferrari, exquisitely vivid and very much declares Michael’s ethos “I want to shock you with colour!” Unusually the pigment is bought from a car battery company in Germany, proving once again, that the Harding paint-making techniques are by no means average. Rose Madder is typically known for not being 100% lightfast, Michael stresses that he wants “to make your paintings last for 500 years” so it’s important not to leave your work out in the bright sunshine – the optimum conditions would be like a gallery. Rose Madder, like all Michael’s paints, is extremely highly pigmented, so any fears of the colour draining from the painting are unnecessary. Lead Tin Yellow, is a rare and very beautiful shade of yellow. 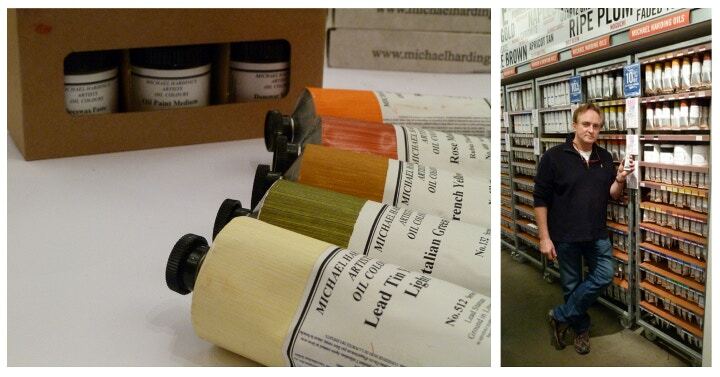 Michael’s favourite paints are lead based as they’re so much more tactile and as the Old Master’s would have used. There is clear emphasis in Michael’s paint making process of the traditional techniques and materials used; it seems you could use his paints to recreate a Rembrandt. French Ochre Yellow is, as expected, a deeply rich colour and the perfect addition for a Caucasian flesh tone – mix Rose Madder with French Ochre Yellow and Cremnitz White for infallible results! Last but not least, Italian Green Umber’s olive hue makes it ideal for landscapes. Like all his paints, Michael Harding’s thorough process and attention to detail means his new releases only set the standard higher for his range. Cass Art’s Michael Harding Medium Pack is also one to watch, containing 50ML of Beeswax Paste, Oil Paint Medium and Dammar Varnish it covers every aspect you could need. Michael himself says "Don't use a medium, if you can achieve with the paints what's in your mind's eye, don’t make the materials fight, stack the odds to help you". If you do find you need a medium, remember not to use more than 10% of the paint’s volume for the medium and don't varnish the painting until it's been drying for 6 months. Another top tip from Michael: “Don't leave turpentine in the sunlight, the water separates out and will create a cloudy varnish”. Health and safety is an issue to take into account when dabbling with oil paints, all of the Michael Harding range is very high quality often includes cadmiums so it’s imperative that artists don’t smoke while painting– if paint on your fingers is burnt then you could inhale the toxic fumes. Michael’s oil painting tips are endless: store your paints upside down to ensure that any excess oil drips out of the tube before you begin painting and use warmth and a little sunlight in order for your painting to dry as quickly as possible. “There are difference between nature’s gift and the man-made version” – Lead White is made in the same way the Romans did: heat the lead over vinegar where the vapour will leave a lead acetate – then bury under horse dung (it has to be horses as theirs provides the most carbonic acid). Nowadays it has to be distributed in cartridge form so that no-one will mistake it for toothpaste! Lead White is the best all-rounder of the whites, physically strong, gentle and best to intermix, saying that Titanium White has the most covering power. Mixing a colour with Zinc White will retain the freshness and the 'zing' of the original colour. It’s clear that every colour in his range holds a specific purpose, Michael Harding’s hands on approach to paint making results in a beautiful range of traditional oils suitable for everyone. Come in store or shop online to make the most of Michael’s fantastic range.